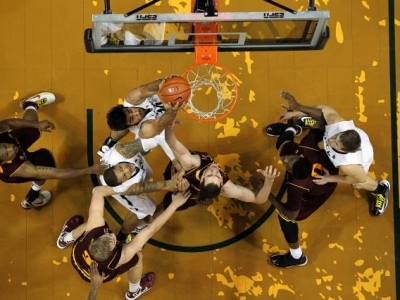 The Sun Devils gave a valiant effort tonight against the Oregon Ducks, but fell short 68-65. ASU was in this one until the end, but Carrick Felix has his last second three point attempt slip out of his hands at the final buzzer. You could sense the intensity and passion from the Sun Devils right from tip off, as they played with heart and determination throughout the game and gave themselves an opportunity to win at the end. One thing is certain, ASU basketball has found an identity and definitely proved that they can hang with anyone in the Pac-12 conference. Jahii Carson finished the night with 20 points and once again showed that he is one of the premier point guards in the conference. On this Oregon road trip, he really stepped his game up and has found his place in Herb Sendek’s offense. There is no question that he is the leader of this team. The other star of the evening was Evan Gordon. Although he has been inconsistent at times, Gordon found his groove tonight and was a major asset to the team. He finished with a season high 17 points and made some big three pointers throughout the game. Carrick Felix finished with 12 points, Bachynski with 8 and Gilling with 5. However, one of the main difference makers tonight was the missed free throws. ASU finished 5-9 from the line for 55.6% and Oregon was 14-15 for 93.3%. A lot of these Pac-12 games are going to be close, so free throws will continue to play a major role. Definitely something the team needs to improve moving forward. The good news is that this group is playing as a team, playing with passion and with a love for the game. All good things with UofA coming to Tempe on January 19th. Should be a great game.